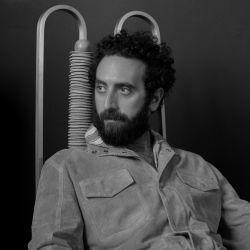 "Milanese by birth but New York based for the last twelve years, Mario Milana has brought his artistic approach overseas, fusing cutting edge design with traditional craftsmanship. After eight years in the studio of the prolific Karim Rashid, in which he learned to relate to a vast range of materials and methods on every scale, Mario Milana decided to open his eponymous studio atelier, in which he could give rise to his own personal design language. A cardinal element of his stylistic approach is the fusion of geometry and simplicity of line with the concept of dynamism. His pieces actually rotate and orbit, not only in shape but in the aspect of actual movement: the backrest, elements of the table, or the screen, can morph into different configurations, just as the side tables that become shelves or the evolving sofa. The dynamism in his designs springs from an ever present eye towards functionality, making the object or piece of furniture able to fill various needs. If Osvaldo Borsani gave birth to the concept of movement in an industrial production, Mario Milana has applied this mechanical approach to a rigorously artisanal one. In his design practice the unexpected touches of dynamism are found in his love of handmade production, marked by his use of natural materials and his deep respect for artisanal traditions. The result are collections, or environments, in which he sagaciously balances geometric and organic shapes and the marriage of refined aspects with those purposefully left raw; it is a style that is at once cold and mechanical and yet deeply infused with human warmth." "Metals, for their capacity to change and evolve." "Surprised, hopefully in a good way!" "The next project. Curiosity. Be relevant. Create only what you love. Design, not style." What makes a space special? "Constant sketch flow. Some designs I have been sketching for years and are not defined yet, others are done in one take." What funny moments, unexpected surprises, or obstacles have you encountered? "Overcome the stereotypical notion of a precious object."